125ml upto 250ml clear or amber containers certified to <20ppb TOC. packed in boxes of either 12 or 24. 17ml, 18ml, and 60ml tubes certified to <20ppb Total Organic Carbon (18ml Low Level Tubes available to <10ppb TOC). All tubes supplied complete with screw fit cap. Speciality TOC free water supplied in certified pre-cleaned amber 1lt containers packaged in a class 10 environment. Water is filtered to 0.1 micron through hydrophobic membrane filters and certified to ocntain <50 ppb Total Organic Carbon. 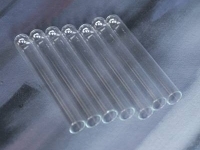 Clear or Amber open top TOC free vials supplied in boxes of 144. 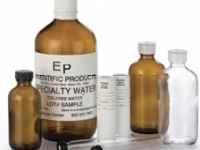 Standard vials certified to <20ppb with a Low Level (LL) version certified to <10ppb.